June is the season for the best of the fresh wild -caught salmon. And, if you've just returned from your first trip to Alaska, sharing your experiences, photos, and some salmon is a great way to extend the memories. That's just what Dan and Dianna did when they invited us for dinner on Saturday, along with our other neighbors, Kenny and Phyllis. Turns out all of us have been to Alaska, so we all took turns sharing our impressions of the magnificence of the faraway American frontier. We had the perfect evening for dining outside, something that doesn't happen often in southern Illinois. The setting was so inviting that I insisted we take pictures of Dianna's table that was definitely worthy of a magazine cover. 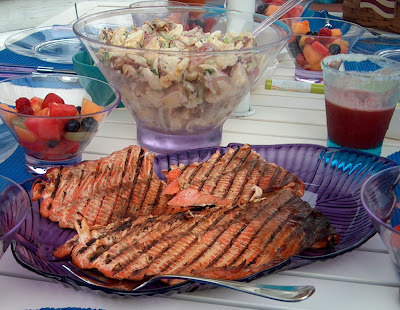 Dan smoked the salmon on his Weber with charcoal, low heat, and wood from his own apple tree -- outstanding job! There was also potato salad from Emeril Lagasse that was also photo worthy and delicious. Phyllis made marinated cucumbers, always a sign of summer, as are the fruits in the gorgeous fruit salad. The virtues of eating fish and fresh fruits and vegetables paid off in big rewards at dessert time -- we had room for Dianna's brownies and Kenny's rhubarb bread pudding. I just love it when my friends go to Alaska!